DHL’s investment in the 777 Freighters comes in response to the growing demand for global express capacity. Cross-border e-commerce sales are forecast to grow by more than 19 per cent a year to reach $4.48 trillion by 2021. The B777 is the largest twin-engine cargo aeroplane, and is capable of flying 4,900 nautical miles with a cargo load of 102 tons. DHL was the first express operator in 2009 to introduce the 777 for long-haul time critical services. 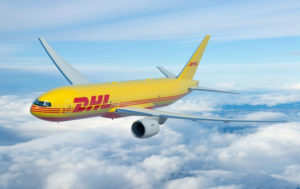 The new order will double the size of DHL’s global 777 fleet. Qatar Airways also finalised an order for five 777 Freighters at Farnborough in a deal valued at $1.7 billion. The carrier operates a fleet of 13 777 Freighters and two 747-8 Freighters. This latest order will expand its Boeing Freighter fleet to more than 20 jets.